Ariana Hoffman has been working in the field of the Decorative Arts for the past 20 years. What was considered genuine natural ability, curiosity and a form of expression has been turned into a full fledged decorative painting company. After graduating from Syracuse University in ’94 she began a seven year collaboration with a major nationwide furniture company redefining their antique and old world paint finishes. Thru that experience this self taught artist was able to begin her own solo chapter starting The Decorative Artist. That company has now evolved into A.H. & CO. - combining the talents of many additional artists, woodworkers, and fine finishers. 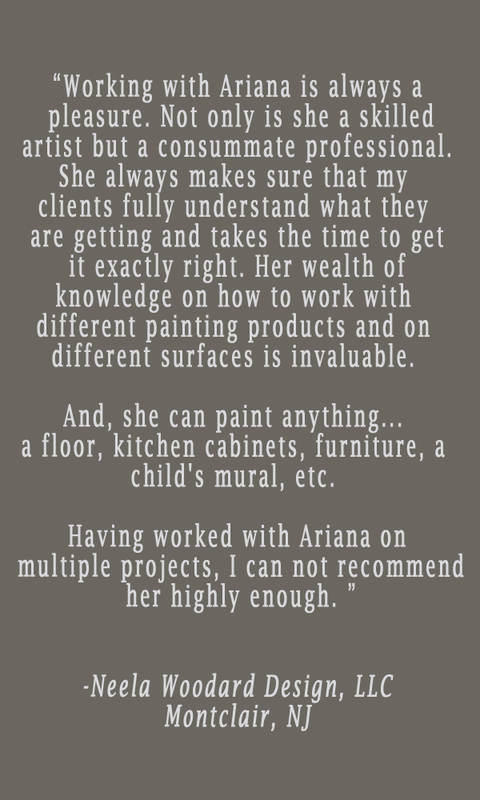 The privilege of traveling around the country for her art as well as developing the continued relationships with her local clientele give Ariana a well rounded view of what is happening in the world of Decorative Painting. Her one of a kind artistry can be seen in multiple national publications, commercial offices, show houses, boutiques and private homes. Highlights in the past year include the commission of an antique nautical style hand painted compass rose for the lobby floor at the Montauk Yacht Club soon to being updated and redone in a new celestial motif starting in March 2018. Her team will also be partnering with the new Summit, NJ salon Silver Vine Room completing a beautiful custom mixed stain patina on all of their custom made woodwork fixtures. Currently, her latest platform is in partnership with North Caldwell Designer Linda Kessler - developing a new abstract painting service called The Unique Canvas. Designers and buyers will be able to schedule a personal, in house visit with one of the owners to custom collaborate on the design of their own specialty art piece. All canvases or paper art is created for the client by choice of color, texture, style and size for a one-of-a-kind, made to order artwork. 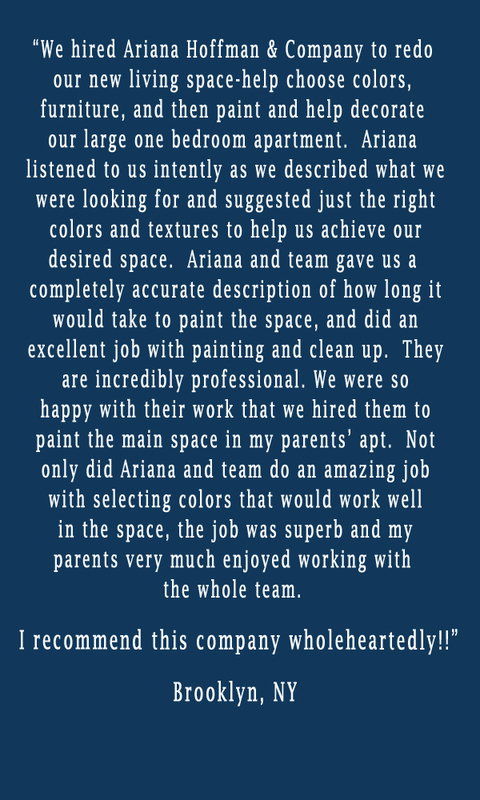 Ariana and her team value the necessity of the right color tone, finish choice and professional execution in every project. Custom concepts are developed for the client in order to obtain the highest level of artistry. 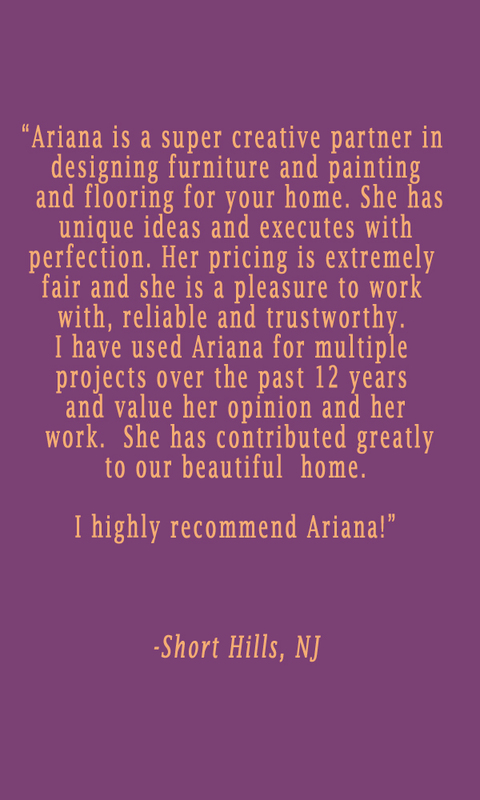 The appreciation of this is seen by her discerning and varied clientele’s trust and consistent continued business. The artist client relationship is what inspires all of these great works of art.